Some operations are urgent. It is therefore essential that the data room solution is easy to use so that the various stakeholders who have access to it can directly focus on their operations. 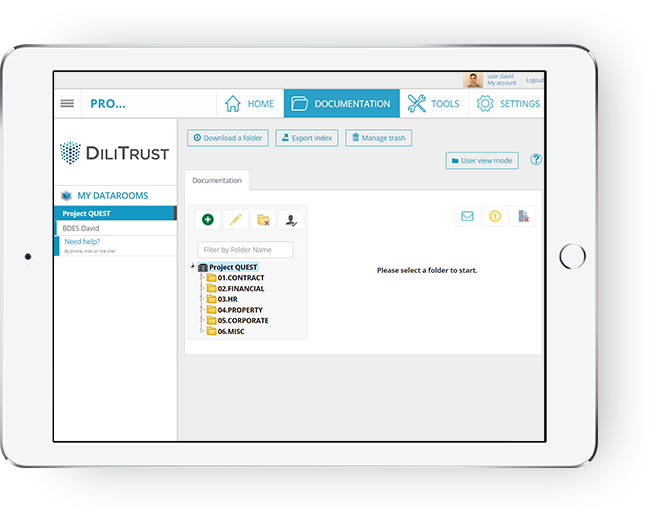 It is in this spirit that DiliTrust Data Room was developed: an intuitive platform on which every feature has been designed to be done with as few clicks as possible. No ineffective call center, with us a referent consultant ensures the success of your operations. More than just technical support, proximity support will provide you with all the necessary advice in terms of good practices observed throughout the DiliTrust experience. Accessible from anywhere with a simple web browser, DiliTrust Data Room does not require any software installation. Everyone can have their own account, which allows for better monitoring of actions and optimal security. Unlike leading virtual data room providers, the price is not calculated based on the volume stored in the data room. The management of access rights can be done at the level of files as well as documents. They are also configurable by teams and by users. The user experience is constantly evolving. The solution is improved in terms of comfort of use. Advanced collaborative features allow users to share their work directly from the secure environment of the data room.